Dragons 3B Gavin LaValley went 3-for-5 with a homer. The Dragons offense was led by Gavin LaValley, whose three hits included a solo homer. Ronald Bueno, Brian O’Grady, Avain Rachal and Narciso Crook additionally had two hits each for Dayton. 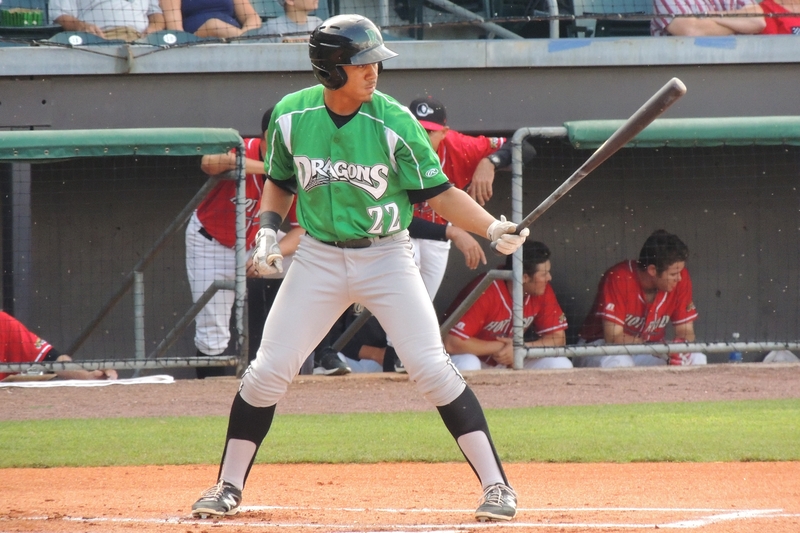 Dragons LF Narciso Crook went 2-for-5 with a two-run double. Jonathan Reynoso went 0-for-4 with a walk, yet managed to reach base four times. In addition to the walk, he reached base on an error three times. 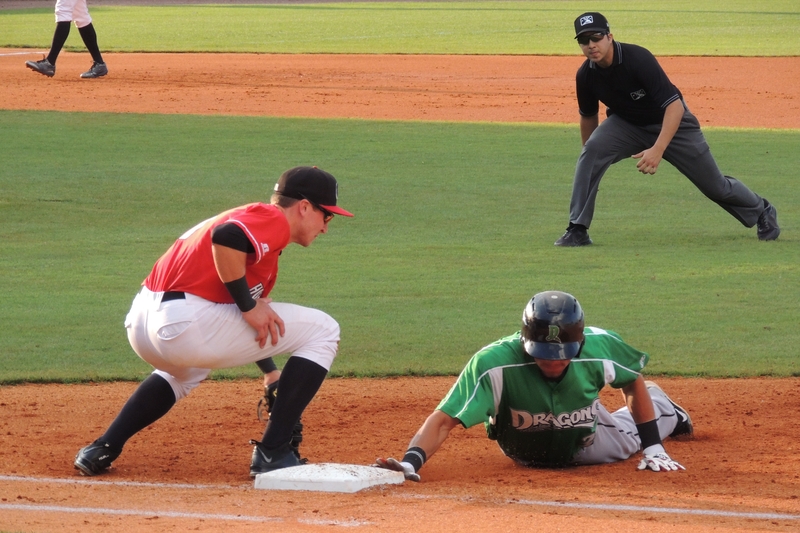 Dragons baserunner Jonathan Reynoso slides back safely to first. Alec Sole is manning the base for the Hot Rods. 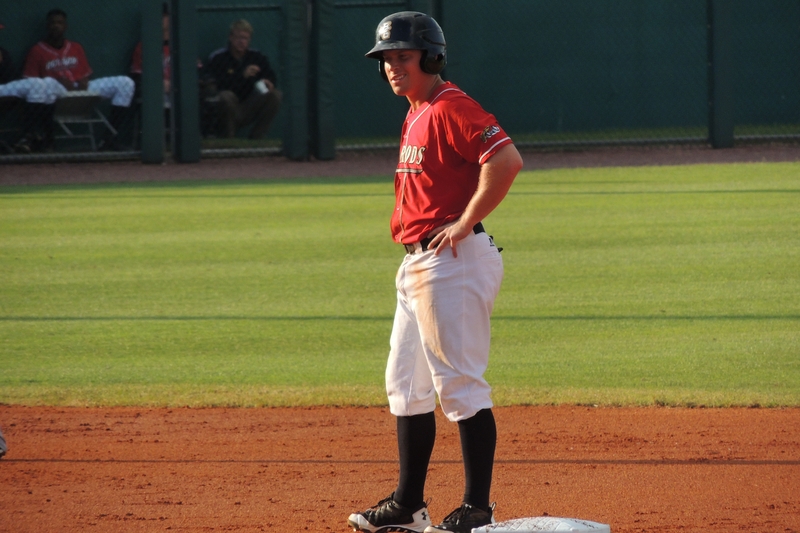 Riley Unroe was the only Hot Rods player to collect two hits, though Thomas Milone and Mac James each drew a pair of walks. 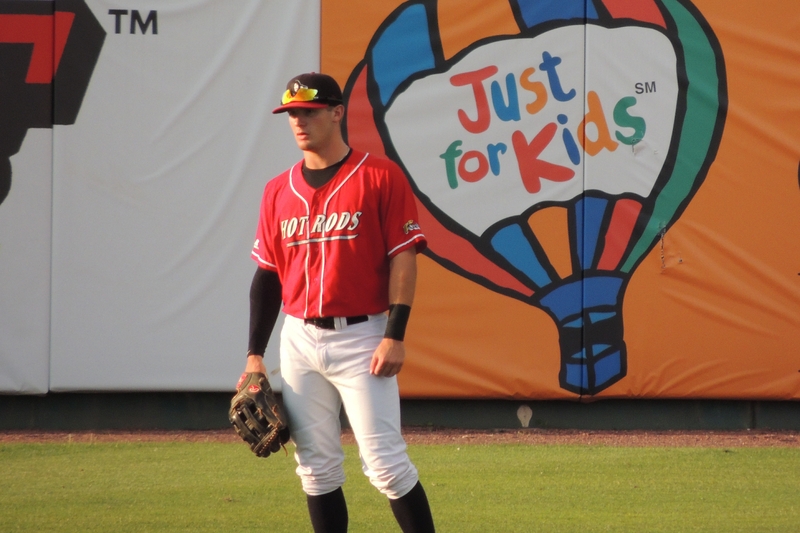 Hot Rods 2B Riley Unroe stands at second base during Saturday’s game. Just as he had earlier in the series, Milone showed off his defensive skills with a great play in the outfield. LaValley, who had homered earlier in the game, crushed the ball to deep centerfield, but Milone hauled it in by making a catch while running at full tilt. LHP Mike Sullivan was credited with the win after striking out four in three scoreless innings of relief. He gave up one hit and one walk. The four-game series closes out Sunday with a matinee game that pits Hot Rods RHP Hunter Wood (0-2, 1.44 ERA) vs. Dragons LHP Junior Morillo (1-1, 4.09 ERA). It will be my last game in Bowling Green on this road trip. 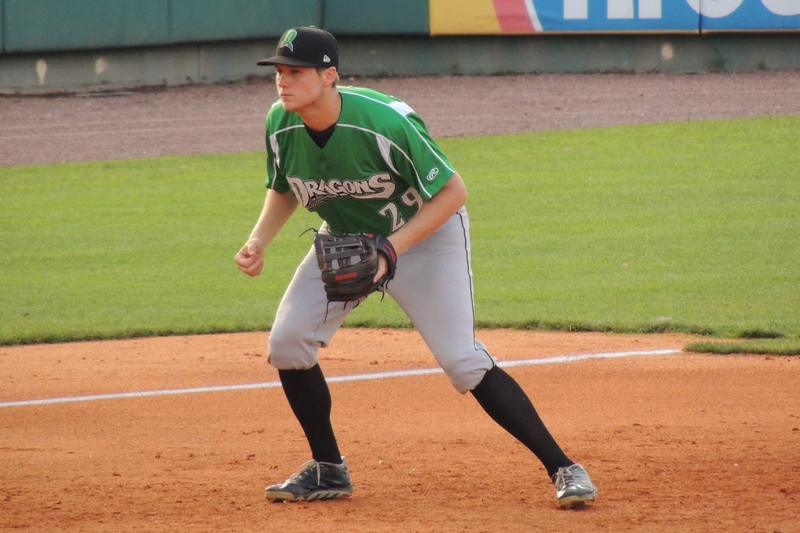 Note from the Dragons game story: Garrett Boulware and Shed Long completed three-game suspensions Saturday and will be eligible to play Sunday. 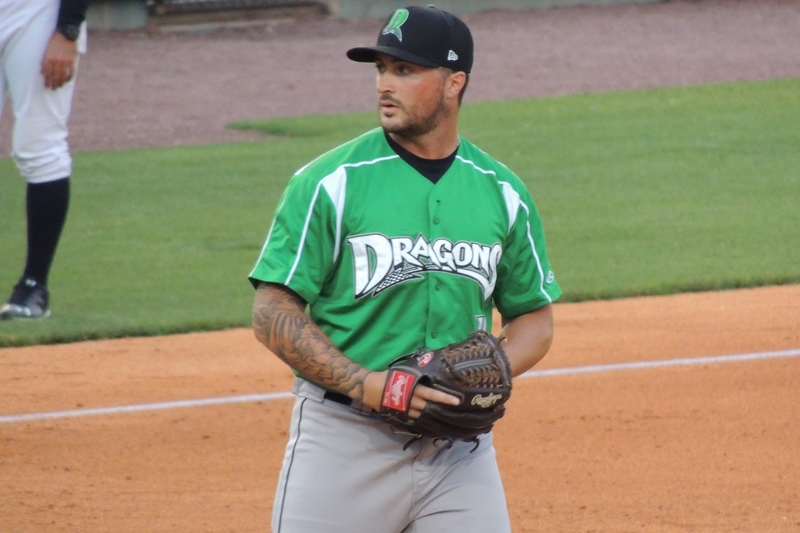 Both were among seven Dragons players suspended after an on-field altercation at South Bend on June 17. Avain Rachal and Jose Ortiz will begin three-game suspensions Sunday. 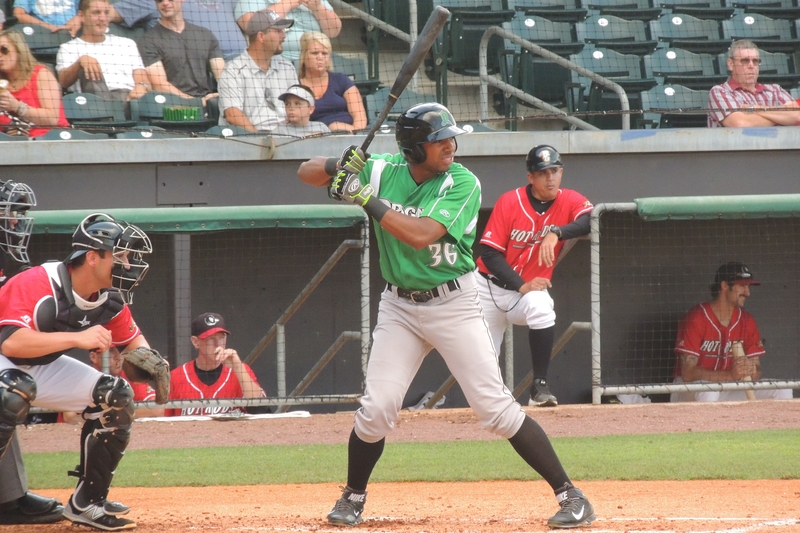 This entry was posted in Bowling Green Hot Rods, Dayton Dragons, Midwest League, South Bend Silver Hawks. Bookmark the permalink.